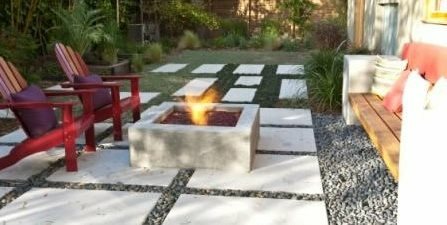 This fire pit is surrounded by a permeable patio that allows water to easily re-enter the soil. Amy Williams Photography for the City of Santa Monica. 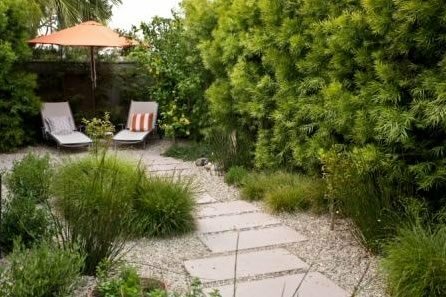 This inviting garden proves that water-wise plants can be lush and green. Amy Williams Photography for the City of Santa Monica. 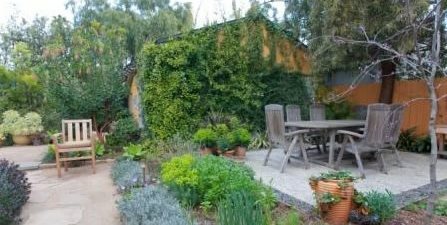 This sustainable garden features a permeable gravel dining patio as well as colorful water-wise plants. Amy Williams Photography for the City of Santa Monica. 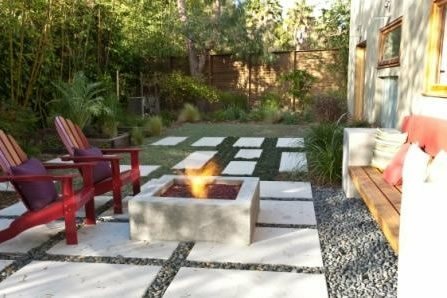 Sustainable landscaping is gaining popularity, especially in the Western states. It used to be that water-wise landscaping meant a front yard full of gravel with a few cacti and maybe a tree. This is no longer the case, innovative landscaping professionals are revolutionizing the way we think of sustainable landscaping. 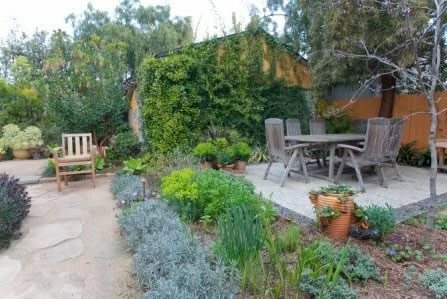 If you still aren't sure, check out these examples of sustainable gardens from the city of Santa Monica. 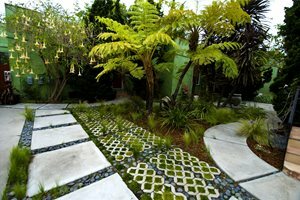 Now, with cities across the West realizing the benefits of sustainable home landscapes, and offering rebates as an incentive, it is easier than ever to redo your yard in an environmentally friendly way. Who is eligible to receive sustainable landscaping rebates? Typically eligibility hinges upon your property being within the city limits and you being a paying customer of that city's water department. You must also be willing and able to make the initial investment in the upgrades; you will be reimbursed after the completion of your landscaping project. What landscaping upgrades qualify for a rebate? Simply beautifying your landscape will not automatically qualify you for a rebate. The improvements you make must be focused on sustainability, or more specifically water conservation. When do I need to apply for my rebate? Most cities require that you apply for your landscaping rebate after the planning phase, but before the construction or installation phase. Some programs even require a pre-inspection of your property, so start the process early. The city must see what improvements are planned and how much they will cost in order to determine whether or not you will receive a rebate and how much money will be granted. An experienced landscape designer or architect can provide the type of plans many cities require. Where are rebates being offered? 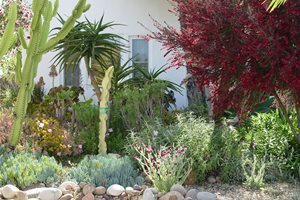 Sustainable landscaping rebates are offered by local governments in areas that are prone to drought. The rebate programs are designed to promote water conservation and decrease run-off. Check with your city water or conservation department for more information. 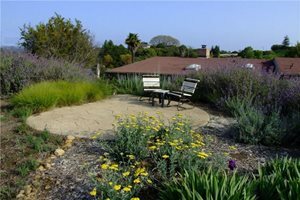 Why should I upgrade to sustainable landscaping? Upgrading to sustainable landscaping is a good choice for multiple reasons. First, you will save money in two ways - through rebates and on monthly expenses. The local rebates will help offset the cost of the upgrades; some cities offer up to 50% of the costs, making the project an affordable option. Additionally, you'll save on monthly bills because less water will be required to maintain your landscape. Second, the amount of maintenance required for your yard will be reduced dramatically. This means that the time you used to spend mowing your lawn can now be spent relaxing and enjoying your revamped outdoor space with friends and family. Finally, when you switch to sustainable landscaping you'll be helping the environment by reducing your water consumption and reducing run-off which can cause pollution. How do I get the work done? Contact a local landscaping professional, many of them know all about the rebates available in your area and will guide you through the process. If you are having trouble finding someone who has experience with the rebate process contact your city, they may have a list of landscaping companies that they have worked with previously.